Achieved a certain clarity wrt part timers, criterion for hiring. I think I'll only hire those who appear to have the potential to become a partner at JT. Even though this is only a part time position. On the way home just now, received one of the more interesting calls of my career. When I first re-popularised fully canvassed suits about 8 years ago, none of the incumbent tailors were prepared for the enquiries and demand for that garment. They responded differently. One leading and entrenched tailor decided they will not bother re-recruiting and retooling their workforce---they will soldier on with fused. Another tailor in a major shopping mall which had at that time only opened for business for several years decided to undertake the pain of building capacity for fully canvassed jackets. Through his contacts, he wooed a Malaysian coatmaker then working illegally in London to return home. "Think of the bah kut teh!" he must have said to him. "Chow kueh teow and teh tarik for breakfast!" I don't know the specifics of how he did the wooing, but the coatmaker who had been making jackets for 8 years in London returned to work for him. The coatmaker lasted several years. This tailor then disbanded---disssolved!--- his workshop. His entire volume was then made by a factory which also serves many other tailors in KL. Unemployed, this coatmaker then moved to Johor, making fully canvassed jackets for the Singaporean market. He later went to China, but did not find what he was lookin for, and is now back in KL. He called me just now. He wanted to know if he can work for me. Obviously, this year, we have a new minister. Who obviously needs some JT in his life and on his person. Sponsors are invited to a press conference with the minister. Problem is, it's very expensive. I think it's beyond my ability. Also, it is not directly connected to beauty or greatness, the themes of JT. This jacket goes on a 3 week business trip to the US. Customer in private equity. Coatmaker B told me he saw his own hands on TV. He saw my TVC on his own TV. So I met up with him just now. After a while talking to each other, I started detailing the reasons why I fired all the coatmakers I fired. In every case he disagreed with me the firing was justified and necessary. (Obviously, I disagree with him.) He then declined to work for me. Smart move. Saved us both a lot of time. In parting, he said to me I need to learn to appreciate good workers. I said I do. Why wouldn't I? It's just, our ideas of what constitutes a good worker diverge strongly. My standards of a good worker is only about 100X higher than his. He called me up just now to say, instead of him resigning from the workshop where he is employed to work for me (where he'll likely be fired), why don't I be a customer of the workshop where he works? I said, great idea, I'll consider it. I have no interest. I know the founders of that workshop. Mercenaries. His fundamental problem is, he thinks it's about making money. Be paid a lot for what you do; in his case, making jackets. He was able to name me the number of hours needed per jacket. But that is not the understanding at JT. We obviously get paid what we ask for. But getting paid is not the reason for working. There are far higher ideals! He knows nothing about these. In much the same way that we do not live to breathe though air is essential for life. That is just too low. His thinking is just like the sifu. Money, money, money. Part Timer B was saying, why not recruit more freelancers? I'll help you, he said. For some reason, it never occured to me to do so. Now, I'm thinking of recruiting a freelance graphic designer, a videomaker, and a content creator (long form). All will probably be UM students, since that's how the network works. I'm taking content creation more seriously now. I have a better appreaciation now of how it fits into the overall competitive strategy. I currently have a writer (who makes a living by writing) working on another piece. I saw the first draft last night, and suggested significant amendments this afternoon. I’m in need of a suit, and a couple of pair of trousers. Is there anyone else aside from Ah Loke one should consider comparative in terms of workmanship and cost in KL? Thanks in advance. Unbelievably, Norton & Sons liked one of my IG posts. Unfortunately, it was the one featuring my Rolex. Not the peacoat. Not the cream jacket. Not even the milky way lining. I'm having a new suit made for myself. Bendahara, Carlo Barbera Riserva 1911 Super 150's. I thought, since it's for myself, I should make the canvas myself. Horsetail chest canvas. I don't normally use such a stiff chest canvas, but I like some structure in this one. Became night once I was done with both sides. Took me about 2 hours. After the fittings, the canvas will get additional sewing to complete it. I made a better version. Please forward to those who you think might find the positions relevant. Had my first fitting for a suit and odd pair of trousers, shown in the photo. As this is my first suit, would appreciate any feedback on the fit. Thanks in advance. Trousers appear rather roomy and too long. But both are matters of preference. Back balance should be reduced. Posture looks unnatural in most of the pictures. I normally am in no hurry during a fitting, and after a while, the customer forgets to maintain his "aspirational" posture. He relaxes into his real day-to-day posture. I also issue the cue to "relax your shoulders". That's when the actual fitting begins. People go into all kinds of weird postures during a fitting. They think it's a good idea. When I gaze frontally at some people, they would jerk their heads back, push their chests out, and sort of part their arms from their sides. Presumably to give me a better view. So I have to get them to stand normally again. All that preface is to explain the ambiguity of the fit I see. What is not ambiguous is the shoulder slope, which is currently cut for a higher shoulder than yours. Both front and back shoulder. Back balance should also be reduced. Obviously, it is a little roomy in the waist. Once the back shoulder slope has been made even more sloping, part of the creases in the upper rear sleeve will be reduced. But I don't think they will disappear completely. So the sleeves should be mounted such that they hang more towards the rear. Within the space of 30 minutes, I received two very interesting calls. One was from a supplier. "Jeremy right? Wait, wait, I have someone here who wants to talk to you." Then the other guy spoke. I know who he is. A coatmaker. I can't divulge more details because it might negatively impact his job security. But basically, he would like to make jackets for me. Then, another call from the pharmaceutical company. I have been waiting for the first 50% since forever, but they just wouldn't pay me. Now they tell me my cheque is ready, but it is for the full amount. Do I go out and buy a Day-Date or something (on the bracelet)? Actually I find the Breguet La Tradition also very interesting. Jeremy, thanks for taking the time to reply, appreciate the feedback. When you say "Trousers appear rather roomy and too long... Back balance should be reduced." Aren't the trousers too tight in the seat and cut too close to my upper thigh. How would you recommend a cleaner drape in the rear of the trousers, and without my arse sticking out? You were spot on about my "aspirational" posture (I'll know who to go to when I next need a suit), although this was partly due to the feeling tight from the gym the night before, and being distracted with the tailor taking an odd quarter squat posture, and I felt he was going to topple over with my phone in hand. Does the jacket look an inch or so too wide in each shoulder? From the photos are you able to tell if the arm holes are too low? I ought to have taken a photo with my arms to the side. When trying on the jacket, I found it somewhat restrictive in raising my arms and understand that higher arm holes are better for mobility. Finally does the lapel gorge look too high or is simply due to my inability to stand upright? Now that you point it out, the trousers appear tight in the seat but rather roomy from mid thigh down. Shoulder width is difficult for me to tell from the pictures. Ambiguous. Likewise armholes. The top edge of the lapels on the baste is not where the gorge will be. The gorge will be at a more sensible position once the jacket is made. Serendipitously came across this. Perfection. The way the collar fits the neck, the way it flows into the lapel. The perfect, sculptured shoulders and perfect sleevehead. So rare to see this. 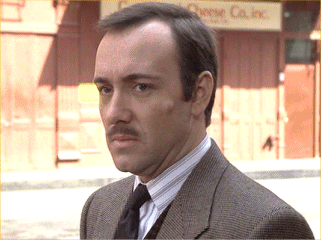 Kevin Spacey in See No Evil, Hear No Evil.